What's the difference between the OnePlus 5T and OnePlus 5? OnePlus is back with its second flagship of the year, but just how much of an upgrade is the OnePlus 5T on the OnePlus 5? 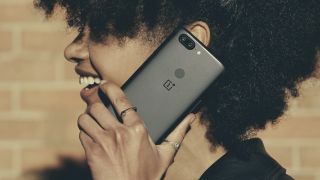 There's not a new number in the name – you'll have to wait for 2018's inevitable OnePlus 6 for that – but there are still a lot of changes, affecting everything from the screen, to the camera and even the ways you unlock the phone. With that in mind we've put the two phones head to head, so you can take a deep dive into exactly what's different and what's the same. There's not much change here, as both the OnePlus 5T and OnePlus 5 have a full metal body, but there are some very slight differences to the weight and dimensions. The OnePlus 5 comes in at 154.2 x 74.1 x 7.3mm and 153g, while the OnePlus 5T is 156.1 x 75 x 7.3mm and 162g, so the 5T is ever so slightly longer, wider and heavier than the OnePlus 5, but no thicker. It also only comes in black, while the OnePlus 5 is available in both black and grey. Perhaps the biggest visual change for the OnePlus 5T is the position of the fingerprint scanner, which has been moved to the back. In doing so the company has also removed the home button which sits below the screen on the OnePlus 5. However, OnePlus has added facial recognition to the front, so you can unlock the phone with your face, a bit like Face ID on the iPhone X. It sounds less advanced here, for example it doesn’t work in the dark, but it could still be a major addition – we’ll be sure to put it properly to the test in our full OnePlus 5T review. And some things have stayed the same – as previously confirmed, OnePlus has left the 3.5mm headphone jack intact for the OnePlus 5T. The screen has clearly been given a lot of attention on the OnePlus 5T. For one thing it's grown to 6 inches, from 5.5 inches on the OnePlus 5. It’s also had a resolution boost, coming in at 1080 x 2160 on the OnePlus 5T, while it’s 1080 x 1920 on the OnePlus 5, though the pixel density is 401 pixels per inch on both. Both phones also use an AMOLED screen, just like the Samsung Galaxy S8 and the iPhone X, and speaking of those phones, the OnePlus 5T has a super widescreen 18:9 aspect ratio similar to them, while the OnePlus 5 has a more conventional 16:9 one. You may have noted that OnePlus has achieved this bigger, longer screen without making the handset itself much bigger, and it’s done that by shrinking the bezels above and below the display, which is presumably part of the reason the fingerprint scanner has been moved to the back. You won’t get any more power from the OnePlus 5T than the OnePlus 5, not that you should need any, since both phones have a high-end Snapdragon 835 chipset and either 6GB or 8GB of RAM. They also both come with a choice of 64GB or 128GB of storage, run Android Nougat and will be getting updated to Android Oreo. There are some differences in their software though. The lack of a home button on the OnePlus 5T means that all the navigation is handled onscreen with gesture controls, and OnePlus has added some new features, such as the ability to clone your apps, so you can login to the likes of Facebook, Skype and Dropbox with more than one account at once. OnePlus has slightly upgraded the main camera on the OnePlus 5T. There’s a dual-lens 16MP and 20MP pairing, just like on the OnePlus 5, but while on the OnePlus 5 the 20MP sensor has an f/2.6 aperture, on the OnePlus 5T both lenses are f/1.7, which should improve its low light performance. There are also some improvements to the camera app for the OnePlus 5T. For example, you can use the fingerprint scanner to take pictures, and navigate the app with gesture controls, which also makes one-handed operation easier. Many of the features remain the same though, with both phones featuring a Portrait Mode for bokeh effects and a Pro Mode if you want more control. There’s no change to the battery, as both phones have a 3,300mAh one and support fast charging but not wireless charging. OnePlus hasn’t upped the price for the OnePlus 5T, with it coming in at the same amount as the OnePlus 5, namely $479/£449/AU$599 for 64GB and $539/£499/AU$699 for 128GB. However, the OnePlus 5 itself is out of stock, so you may not have much choice as to which you buy. Some stores may still have it though, and will likely drop the price if they do. The OnePlus 5T mostly seems focused on screen improvements. The display is bigger and higher resolution than the OnePlus 5’s, as well as being more widescreen and having smaller bezels. The face scanner could also be a significant upgrade, but that all depends on how well it works. Camera and software improvements looks smaller but should be welcome, but the lack of a power boost shows that this really is positioned as the OnePlus 5.5 at most. For most users it probably won’t be worth upgrading from a OnePlus 5 to, but if you’re rocking an older handset it could prove a better buy than its predecessor, assuming it lives up to its on-paper billing. Will the OnePlus 5T make our best phones list?